Need some extra cargo room for your truck or automobile? Great day’s Hitch-N-Ride has the right stuff to handle the job. Whether you are taking a family vacation, hauling some firewood, taking the kids to the ball park or headed to the camp, the Hitch-N-Ride will make your day, no matter what kind of vehicle you drive. The Hitch-N-Ride easily handles all kinds of cargo – luggage, ice chests, firewood, cartons, sports equipment, hunting equipment, etc. – most things that normally require trucking. With 7 inch side-rails and handy tie-down points, the Hitch-N-Ride secures and delivers your “precious cargo” on-time, every-time. 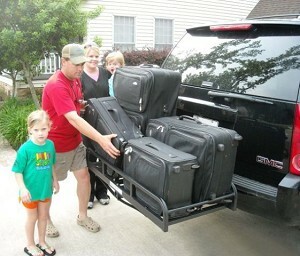 The Hitch-N-Ride is constructed of air-craft aluminum and weighs only 22 lbs. The 22’ X 50” cargo cradle has a hefty 400 lb. 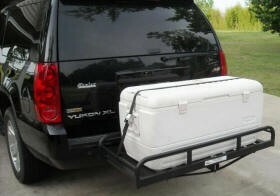 carrying capacity and conveniently attaches in any 2” trailer-hitch receiver. NOTE: We recommend the use of the HS10010 Hitch Stabilizer,with this product. NOTE: The HNR1000T and HNR2000TB will not work on a vehicle with a rear mounted spare tire.